A patient presented in January 2018 following a motor vehicle accident (MVA) to a chiropractor licensed in Colorado. This doctor, trained in x-ray digitization and utilizing the Analysis System Software, adjusted the full spine according to the computerized rendered conclusions that identified the primary biomechanical lesions of the spine while avoiding compensatory spinal segments. In the absence of any osteophytes, as per He and Xinghua (2006), verifies this is a recent injury vs. chronic and consistent with the MVA history as causality. The patient demonstrates the findings of a sudden impact injury with severe loss of the cervical curve and forward head translation. Loss of the cervical curve and FHT (forward head translation) is the single common etiology of almost everyone with musculoskeletal complaints from an MVA, based upon the experience of the authors. 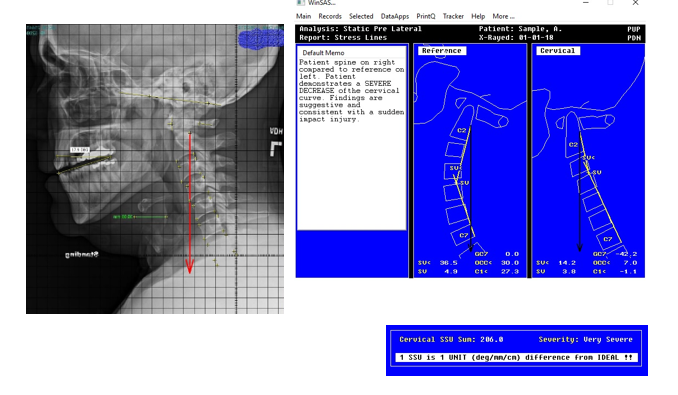 The computer graphic above is for patient education, illustrating a normal cervical for comparison for the patient. In this case the patient was rated “Very Severe” for biomechanical severity with 19.3 mm of anterior head translation based upon digitization). As patient positioning can influence the contour of the cervical curve, the patient's plane line of the teeth was in a neutral position for the neutral x-ray view. This creates a frame of reference for future comparison. According to Kapandji (1974), this position is the true neutral position of balanced head posture. Lifting the chin to obtain a neutral posture creates the opportunity for the patient to demonstrate more of a lordosis. But typically, they will not. In this example the patient head was in 17.9° of flexion which alters upper cervical measurements. The patient is in natural neutral posture with the plane line of the teeth horizontal. Post chiropractic spinal high velocity-low amplitude adjustments, the patient went from 206 spinal stress units (SSU) to 89.2 SSU. The SSU measures the patient’s geometric departure from a balanced uninjured lateral cervical curve. In this example the patient decreased in stress by 116.8 SSU. This represented going from 4 SD (standard deviations) from normal to 1 SD from normal. Upon radiographic examination post MVA, the patient presented with a reversed cervical curve. 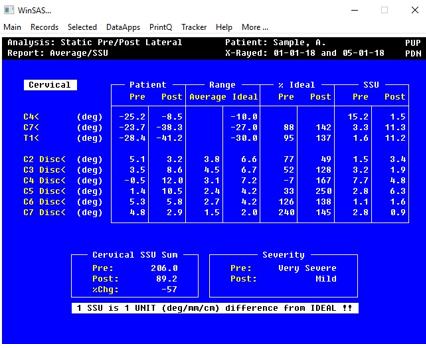 Numerically, this was rated at 206 stress units and post chiropractic spinal high velocity-low amplitude adjustments the patient was reduced by 116.8 SSU units to a value of 89.2, resulting in a minimal of loss of curve as determined numerically. Visually, the patient’s cervical curve was returned to “near normal” with the plum line going from the posterior arch of C1 through the posterior body of C7.